If you are a frequent reader of my blog, you probably have been wondering, Where the heck is Goldilocks? Well, I'll tell you where. She has been lesson planning, grading, and, quite frankly, getting much too much little sleep since school kicked back in for the year. Quite sadly, there never seems to be a free moment to do anything anymore. 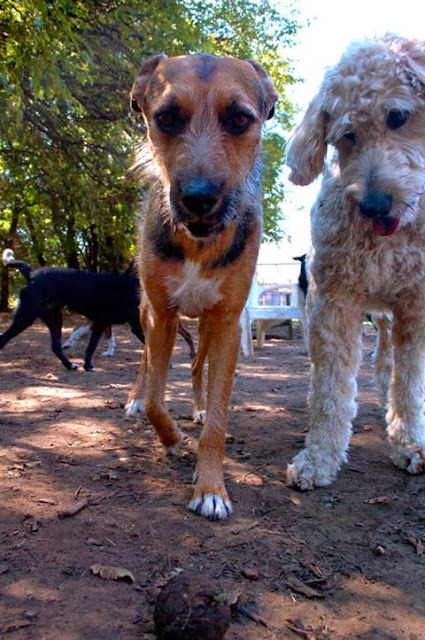 Poor Milt Dog has been missing his momma, but he has been back in daycare, which, you know, he loves! Recently while I was at school, holed up in my room working during my lunch hour, I checked my Gmail on my phone to see if there was anything necessary to be addressed. I saw that I had received a Facebook alert that two photos had been posted of Milton at daycare. You cannot believe how much Jeff and I love receiving these little snapshots of our boy in his "other life" that we know hardly anything about. As I rushed to click over there, I was excited to see these two shots, but I was dismayed to read the captions. Maybe Judd will play with Milt...?? 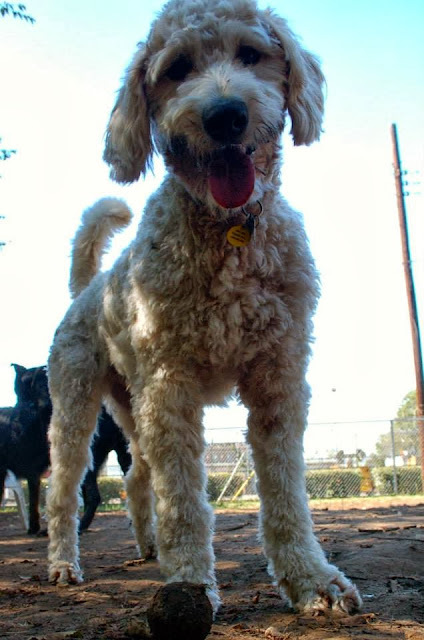 To a dog mom looking at these photos, while reading these captions, it appears that my goldendoodle, essentially, has no one to play with on the playground. He has his ball in hand, or in this case mouth, and not a dog wants to jump in and join his game. This particular dog, Judd, clearly seems pestered and disinterested as he gives Milt Dog the cold shoulder and walks away. Believe me, when I saw this, I wanted to hop in my car right then and there, zoom all the way downtown, and scoop up my little boy to carry him home and be his best pal. I realize this is somewhat illogical, but my heart went out to my doodle. I know dogs aren't kids and kids aren't dogs, but sometimes the similarities are simply overwhelming. Happy Friday, everyone. Enjoy the beautiful fall season, and by that, I mean go indulge in some candy corn, especially the big pumpkin kind...!